The History of Calypso is that of urbanisation, immigration and black reconstruction in Post-Emancipation Trinidad. Some Commentators have seen the calypso as deriving from an older West African Tradition of social commentry, in which praise, blame or derision were conveyed in song or folk tales. 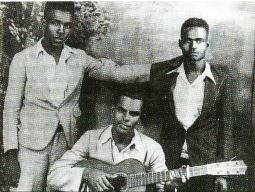 View some of the Calypso pioneers. We hope to improve the quality of some of these photos. In the mean while check out our new photo album. Here are some outside links for more on Calypso. TRINIDAD CALYPSO TENT by G. Godwin Oyewole. THE KAISO NEWSLETTERS by Ray Funk.